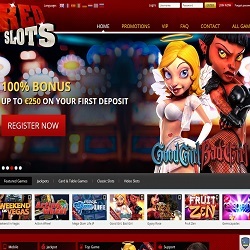 RedSlots Casino is a BetSoft Gaming powered online gaming destination, launched in 2014 by Redcorp, S.A. This first-class game provider aims at slot and table game players with a passion for first-class titles and services. To satisfy all needs, all of their offers were tested and certified by GLI for the highest level of integrity. 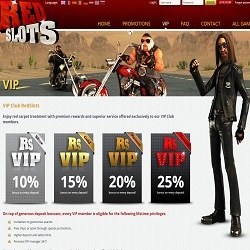 RedSlots Casino’s modern interface has numerous benefits to offer for all their members. The game titles are organized into five categories: featured games, jackpots, card & table games, classic slots and video slots. With the exception of the table games section all menus are well-equipped with popular variants. The site is available in English, French, Spanish, Italian, German, Dutch, Greek and Russian, making it a good choice for numerous nationalities. They accepts euros, dollars and pounds from Maestro, MasterCard, Neteller, Skrill, Visa, Paysafe Card, Moneta and WebMoney. The customer service is available on live chat, phone and mail in 24/7. The mobile site of RedSlots Casino is also really good with superb games to play while on the go. Their promotions are wide-ranging, with different packages, weekly bonuses and freebies. Their Exclusive Welcome Bonus for Blackjackchamp.com readers contains a superb 200% deposit extra up to 50 Euros. RedSlots Casino will be a surefire favorite of many casino enthusiasts especially if they have high standards for a casino. Even though the destination’s main focus is slot gaming, their table games like blackjack are also flawless. With the great weekly and free money bonuses, RedSlots Casino is not only entertaining but rewarding too. RedSlots Casino is powered by BetSoft Gaming, one of the most respected providers in the casino industry. Their games are certified by GLI, an accredited third party testing company with 25 years of expertise in world-class testing. If you’re looking for Blackjack at RedSlots Casino just check their Card & Table Games menu and choose from the variants of this historic game. VIP European Blackjack, American Blackjack, European Blackjack, Super7 Blackjack, Pontoon Blackjack and Pirate 21 are all on offer for card game enthusiasts. For the most comfortable experience make sure to use their online casino with two mobile-optimized titles: Single Deck Blackjack and BlackJack. The gameplay is hassle-free on both interfaces and the design of the games is classy and modern. RedSlots Casino has various games to play, but the selection is not overwhelming. They’re really solid when it comes to slots as Jackpots, Classic Slots and Video Slots are all vastly represented. Besides blackjack, there are numerous other card and table games in RedSlots Casino’s repertoire. Zoom Roulette, European Roulette, American Roulette, Pai Gow Poker, Ridem Poker, Draw Hi-Low, Baccarat, Craps and Top Card Trumps are just some of the titles to be found at this great online casino site. Luckily, players have the option to try the online casino for free before placing real-money deposits. 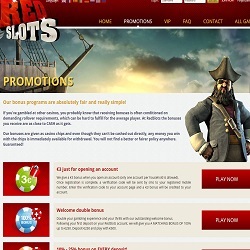 RedSlots Casino has countless beneficial promotions and bonuses. With the Exclusive Welcome Bonus all Blackjackchamp.com readers will get a 200% bonus up to 50 euros. Initially after the verification of an account the new player will receive a 3 Euro bonus to use on any of RedSlots Casino’s games. Furthermore, the Weekends’ first deposits are matched with a 50% bonus all the way up to 250 Euros. The Curacao licensed RedSlots Casino of Redcorp, S.A. is a wonderful casino fun provider with well-crafted services. All of their slots and table games are powered by BetSoft Gaming, one of the most acclaimed developers of the industry. They set high standards for games and promotions to satisfy even the pickiest gamblers. With a 24/7 customer service it’s obvious that the gamers’ trust is greatly appreciated and not taken for granted. RedSlots Casino does not offer live casino games which is unfortunate, but they’re making up for it with great promotions, bonuses and a good variety of games for all devices. 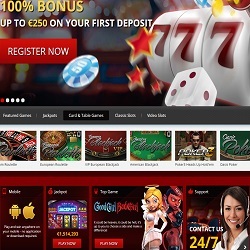 Mobile casino players will be pleased with the fact that RedSlots Casino is available on portable devices with numerous well-optimized and smoothly running games. The mobile site is available in 7 languages without downloading. The games catalogue is filled with Jackpot Games, Slots and Table Games. Some of the titles were developed especially for smaller screens like the Single Deck Blackjack or BlackJack. The experience is just as good as on computer and the mobile design is really user-friendly but not too watered-down. Luckily, all the superb promotions are available on mobile too, so RedSlots Casino’s mobile version is viable on its own.